One question arise: to which page those web buttons are better suited to link? So far, they link to their SVG sources, which you are invited to freely play with. Mascots and Fedora. Do we need one? Do we want one? 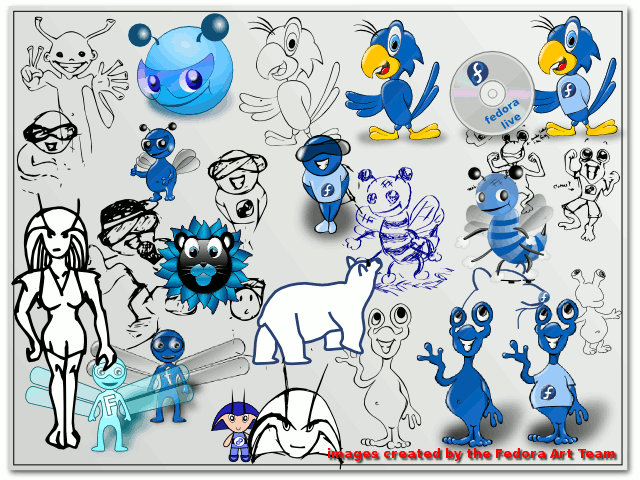 Back in the release cycle for Fedora 7 we had an initiative: create an open process where anyone can play and see if we can come with a Mascot for Fedora. It generated a lot of long talks on mailing lists with strong supporters and opponents of the idea but also a number of contributions (about which I planned to blog but never came to it until now, shame on me!). But it seemed it was not hugely popular inside the Art Team, contributions slowed, the initiative got on hibernation or maybe even died. I don't want to declare it dead or, by contrary, forcedly revive it, I just think is worthy to mention it, as we have a recent topic on the mailing list about its status. So if you want it alive, start contributing, if not, the silence will take care of its [lack of] future. 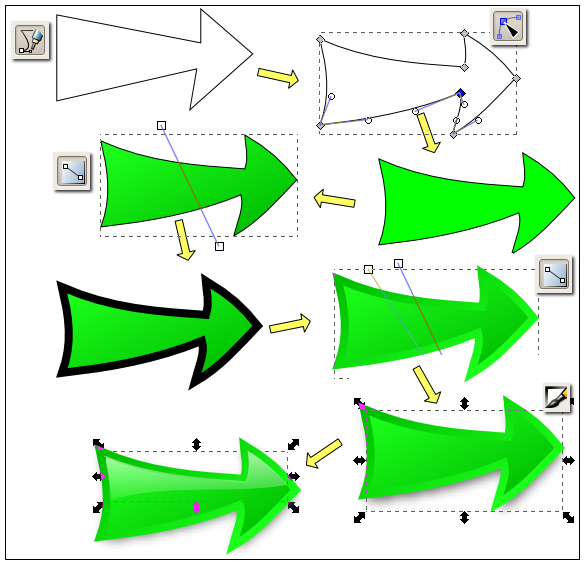 In the comments to my post from yesterday about creating shiny buttons with Inkscape I got asked about "simple howto about how to create planes with reflections of existing objects". Does someone think I can resist? I wrote a simple howto about this effect for both Inkscape and GIMP . And for those who like it this way, there is also a Romanian translation . I understand the uselessness of writing yet another tutorial about creating shiny web buttons with Inkscape, but I think I found a niche: I don't know about such tutorials in my native language, Romanian. So instead of translating an existing one, I was hit by the "not invented here" syndrome and wrote a Romanian Inkscape tutorial about creating web buttons. With the article already written, it was obvious I have to pollute the 'net with it and make an English translation of it (usually I do the other way, write in English and maybe translate into Romanian later). About a month ago I wrote about this experiment: create a website in SVG using Inkscape exclusively, put it on the web, link to it, and wait and see if and how search engines (and Google primarily) will index it. I could present some results earlier, but one stupid mistake made me do have such a delay. To serve a site completely as SVG you have to put a SVG file (index.svg in my case) as DirectoryIndex in the Apache config. Without access to httpd.conf, I used .htaccess for the job, which is just fine. Not so fine is my stupidity: a few day after the site went online I needed a .htaccess file in another subdomain of my site, so I used the one from the SVG subdomain as a template. But by doing file management with drag and drop using Nautilus over SSH, I moved the file instead of copying it, and I had the directory exposed for a few days without an index file. Just enough for Googlebot, which already was all over it due to tons of links, to index the directory content. I got to the conclusion just after one week, but waited a full month trying to repair the mistake described above. The conclusion is: no major search engine will index a website made entirely with SVG, will not follow links inside SVG and will not index the text. My logs show a very large number of visits from spiders: Googlebot, Yahoo Slurp, MSN Bot, even from the Baidu bot, but all those will do is to ask for the website root ("/") and maybe for robots.txt, so the links are not followed. (my robots.txt is empty on purpose, the goal of the experiment was to see what search engines do on their own). I put inside the SVG pages some unique strings, to query the search engines on them later. Of course the queries return nothing, my pages are not indexed and full-text search can't be performed. Google Webmaster Tools say "Googlebot last successfully accessed your home page on Jun 19, 2007", the day when I didn't have .htaccess and index.svg was not served as DirectoryIndex. My little project created a lot of interest from my readers, I got a lot of links to my experiment and as a consequence a lot of visits from various bots. Thank you all! But no thanks to the search engines, which are not able to index pages made with SVG, a W3C standard. Shame on you! Later today, 11 July, is the end date of the Round 1 in the 3 round process to create a new theme for the next release, Fedora 8. Infinity by Máirín Duffy, a collection of photos around the slogan "Fedora: Infinite Boundaries"
Feng Shui by John Baer with the goal to craft Fedora 8 artwork which is harmonious with the goals and objectives of the final product. Floating Cubes by Martin Sourada, based on some kind of projection of N dimensional cubes on plane. Note: those proposals should not be judged by the degree of polishing but by the idea. I am not the final decision maker and not one participating in the "contest" (is really is not a contest, more a collaborative work) so I will take the freedom and comment on those proposals. Infinity is an interesting concept, one on which I think I will try myself some modifications. But it is a mix of different concepts and those will have to be moved from photos to vectors and maybe abstracted a lot. Abstract, an abstract theme is something we are talking about as the opposite direction to take after F7. Many are inclined for such an abstract style, whatever metaphor we will chose. Moon show Mola's well known skill, is a very polished (maybe too polished for Round 1) and beautiful image, but I find it to close to the F7 Flying High. I think two consecutive releases should not have so similar graphics, but we can revisit the concept later. Feng Shui a very minimalistic take. I have to make my mind if I prefer the default theme to be so minimalistic or if I prefer a theme like this to be offered as a default alternative. Floating Cubes is a math thing, appealing to our inner geeks, but I fail to see a metaphor in it. Maybe it should take a minimalistic approach and join with Abstract and/or Feng Shui? Thunder - another beautiful and polished work from Mola. A very strong and powerful concept I can identify with. But sadly, I find it too looking too much like F7. Update: Round 2 will end on 1 August and is dedicated to visual refinement of the images. The way to vote for your favorite is with your time and effort, by providing constructive feedback, preferably with illustrated examples. So people are complaining about the existence of too many redundant Inkscape tutorials for simple things. So how I do those arrows?